This is the only cordless inflator that automatically shuts off when it reaches a desired tire pressure. Ideal for inflating low tires during daytime or nighttime roadside emergencies, the desired pressure is set using its digital pressure gauge, and operating similarly to a cordless drill, a squeeze and release of the locking trigger begins inflation. The Only Automatic Cordless Tire Inflator. In just 90 seconds, it inflates a standard vehicle tire from 25 psi to 30 psi and a mountain bike tire from flat to 55 psi. 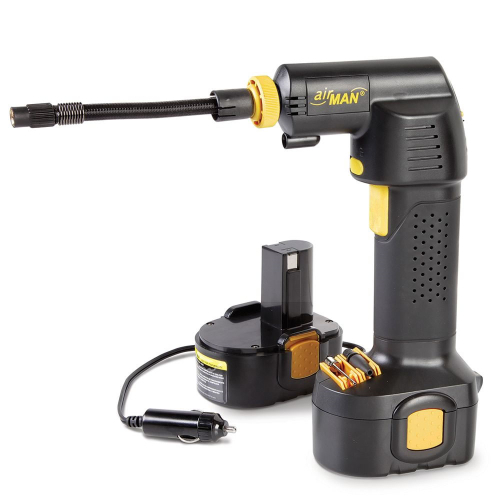 In addition to cordless operation using its lithium-ion battery (recharges in three hours using the included AC adapter), it comes with an 11'-long car adapter that powers the inflator directly. It has an integrated LED that illuminates tire valves, a flexible 5"-long air hose tipped with a thread connector to ensure a proper seal with valves, and two included recreation ball and inflatable toy adapters. Includes travel bag.